If you're anything like me, you were a fan of the hit TV show THE X-FILES, which spawned two movies (and hopefully a third!). And as a fan of THE X-FILES, then you're surely familiar with The Lone Gunmen, three hackers that Fox Mulder would regularly consult. 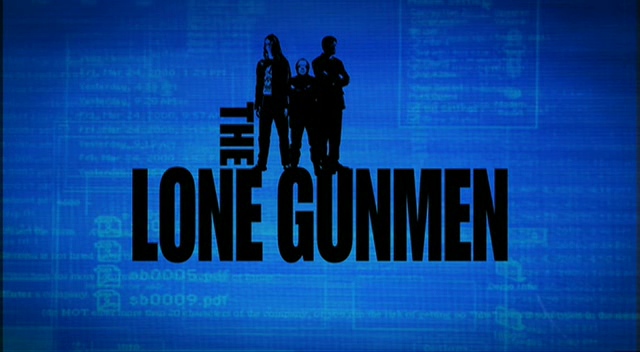 Well, somehow, it totally went under my radar that The Lone Gunmen got their own show in the form of a spinoff, aptly titled THE LONE GUNMEN. I actually learned of this show from a list of best and worst TV spinoffs that I read a few weeks ago. So when I seen that there was a LONE GUNMAN show, I had to track it down, which I did. And I binged watched. All of it. But to be honest, there was only one eleven-episode season. And I loved every second if it. Remember how the three hackers (Frohike, Byers and Langley) always brought that little bit of comic relief to THE X-FILES? I do, and that's basically what THE LONE GUNMEN was all about. It steered clear of the paranormal events and focused more on conspiracies and cover-ups. The pilot episode premiered in 2001, a full three months prior to September 11. I mention this because the pilot episode is strikingly similar to the real-life event that occurred on 9/11. Even for the time (pre-9/11), the pilot episode was a success. The Lone Gunmen officially had their own gig! The show even had its fair share of cameos from some of the X-FILES alumni, including Mitch Pileggi as Walter Skinner and David Duchovny as Fox Mulder. The show lasted a whopping eleven episodes. Sad, really. One season. One freaking season. I think had some paranormal episodes been thrown in then this show might possibly still be on the air, or at least in comic form. Although I hear The Lone Gunmen made their triumphant return in an issue of X-Files Season 10 the comic. Regardless, the show was great and I leave you with two videos to watch. The first in the intro and the second is the controversial pilot episode. Enjoy!